Did Horemheb Kill King Tut? 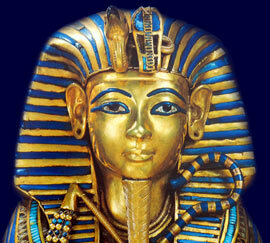 Background information about the possible murder of Tutankhamun and a prime suspect - Horemheb. In 1968 and 1978 x-ray examinations of the mummy of Tutankhamun revealed that the mummy of King Tut had a mysterious dense spot on the lower back of the skull. This lead to speculation that the young King Tut had been killed, or murdered, by a blow on his head. But did Did Horemheb Kill King Tut?? General Horemheb who was the commander of the armed forces during the reign of King Tut, has been put forward as a prime suspect in the possible murder of King Tut. But who was Horemheb and what relationship did she/he have with the Pharaoh Tutankhamun? Did Horemheb Kill King Tut? - Did Horemheb have the Opportunity? As the General of the Egyptian army and the "Deputy" and heir to Tutankhamun Horemheb would have had close contact with Tutankhamun. They would have probably had time alone together. Horemheb would have had the opportunity to kill King Tut, had he wanted. Did Horemheb Kill King Tut? - Did Horemheb have a Motive? Horemheb had a number of motives for wanting the death of Tutankhamun.